Drumming your fingers thinking of what may be profitable on the side? You don’t have to go far, sometimes you can just add a little sweetness into your life by making out cash from selling sweets, cakes and candies! Yes! You can make money out of them! Plus, this is a super low-cost business that’s not really hard to pull off! The only ingredients you need to make this a worthwhile sideline is the passion, determination and perseverance of a budding entrepreneur. And if you are so keen to be everyone’s sweet tooth fairy, here’s how you can start making cash out of selling the very reason of our childhood cavities! 1) Get a taste of feedback about your sweets, cakes and candies first. Ask your friends, colleagues, and peers how they find your recipe! They are the closest subjects to know what your future customers like. Gather as much sweet information and comments as you can. From there, you can use their comments, requests and feedback as ingredients to start baking your plans on selling sweets. It always pays to know what your future customers think. 2) Come up with a name. It’s all in the name! Yes, the most important decision to make is to come up with a name. The name creates a tremendous impact on how customers and investors view you. Psychological studies have long ago claimed a direct correlation between a company/brand name and consumers’ expectations, proving that the stake of a company’s expansion depends on it. Upon choosing a company’s name, the first thing you need to consider is the effect you want it to leave on your target audience. So make one that’s original, unique and appealing, always keep in mind that a creative business name stands out the most. 3) Figure how much capital you need. 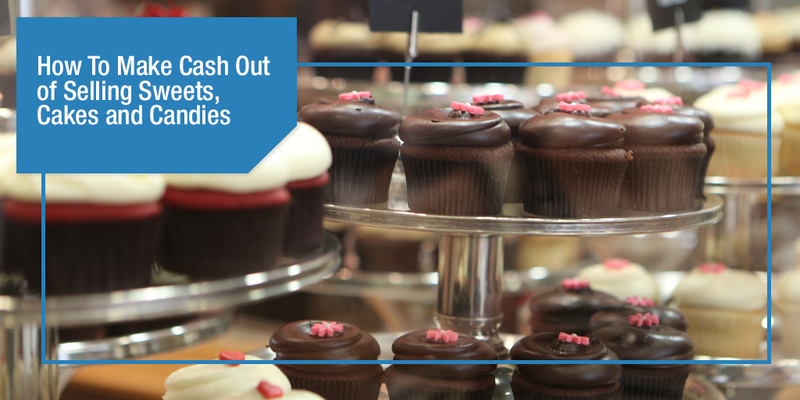 Having a business for candy, cakes and sweets do not require that much big of a budget. You can really start out small, and then expand as your little investment grows. Take inspiration from the success story of ice candy vendors Rodolfo and Rosiell De Leon- the couple who started their business from Php 20. Who would have thought that Php 20 can get you a million pesos. So start small, you’ll eventually get not just a slice of success but a whole cake and candle to celebrate it with. 4) Take advantage of social media and share your story. In this technology-driven time, the fastest and easiest way to reach more potential customers is the use social media! Social media has become your free marketing tool to spread the word about your business. You will be surprised how people will come to know about them! Plus, you can share the story behind your business and build connection. Many successful specialty food items have stories behind them, and stories make people feel good about buying products. It’s also what makes them stand out from their competition. Whatever it is, it’s important that you make the consumer see more than just candy – it has to speak to their heart. Emotional marketing explains that this strategy makes brand transcends mere product status and becomes a friend, Coca-cola, Apple, Jollibee are among top companies that master creating connections through marketing. Now that you’re ready, you can start selling. You can begin by selling it to your friends, colleagues and peers. Ask them to help spread the word for you. You can also tap into your neighborhoods, schools or office spaces. Special holidays such as Valentine’s will also be your favorite dates to sell. You can also offer such to events such as birthdays, anniversaries and that cheesy monthsaries as well. The secret to a business success is to never share what’s making it special. This is a pure competitive market and anything can happen. So, keep that recipe safely tuck. It’s your most important asset. Who knows, eventually your little bakeshop might be a real shop in the corner of a busy avenue in the future. In any case you need extra budget to start, you can always get quick cash loans from PawnHero . PawnHero is your go and beyond online pawnshop that is always here to give you access to affordable credit and to answer your short-term cash needs! PawnHero accepts a wide variety of items to give you quick cash loans anytime, anywhere. Just download the PawnHero app to start or visit the PawnHero website to learn more. Meanwhile, you can also shop for great deals at the online store, Marketplace.ph. Find carefully tested authentic pre-loved brand items up for the grab!